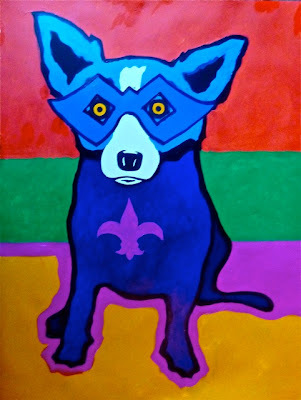 Since his earliest Cajun paintings, George Rodrigue painted the parades, costumes, and colors of Mardi Gras. Over the next six weeks (leading up to March 8th, Mardi Gras Day), I’ll explore that history within this blog, including his Cajun posters for small town Louisiana carnival traditions; twenty years of Mardi Gras Blue Dog silkscreens; photographs and stories from his reigns as King and Grand Marshall for krewes in Lafayette, New Orleans, and Washington, D.C.; the story of the Blue Dog Float for the Krewe of Argus, along with the frenzied collection of its Blue Dog doubloons; and finally George’s current Mardi Gras projects, beginning with the mixed medias featured in this post. In 1872 the King and Krewe of Rex selected these official Mardi Gras Colors, meaning justice (purple), faith (green) and power (gold). 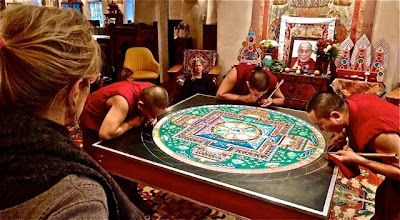 And yet he mentions the sand painting daily, indicating that it resonates still, perhaps in the form of colors, patterns, and strong designs. 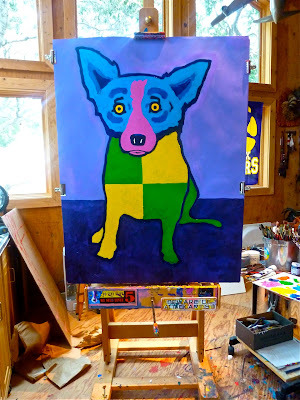 Unlike paintings on canvas, these Mardi Gras images are George’s first as mixed medias, essentially an original silkscreen design printed on heavy paper, so that the Blue Dog remains identical not only in shape (as expected), but also in size and placement. 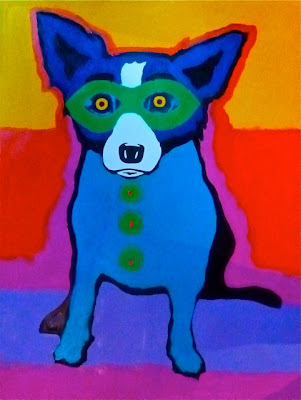 He paints using acrylics, veritably decorating the dog, costuming it in Mardi Gras imagery and colors. The Mardi Gras costume tradition surpasses Halloween in creativity, longevity, and necessity, vital for parties, watching parades, and of course riding on floats. 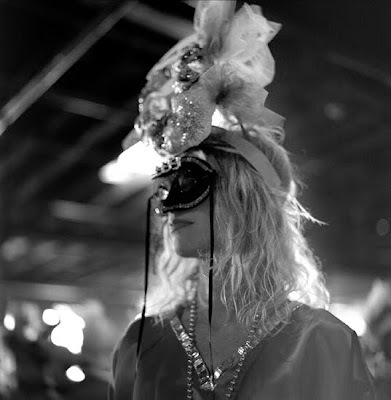 My friend Tabitha Soren* rode with me several years ago in the all-female Krewe of Muses. I recall our headpieces, foam King Cakes, complete with plastic babies and cake knives, driving us crazy as we hurled blinky beads, stuffed animals, and eventually the headpieces themselves (!) to the crowd on Saint Charles Avenue. It’s an insane form of excess and waste, a marathon month-long cause for acute exhaustion and a flu-like recovery, a family event oftentimes confused by the outside press with the confined debauchery of Bourbon Street, a treasured tradition that comforted a wounded region following the worst disaster in U.S. history, and nothing short of an absolute blast. That’s right; we’re putting up a tree next month, an eight foot purple tinsel tradition, covered in masks, beads, clowns, tiny replicas of floats, water meter covers, Saint Louis Cathedral, streetcars, and all things New Orleans. “…All because it’s Carnival Time, woooohhhh, it’s Carnival time….! 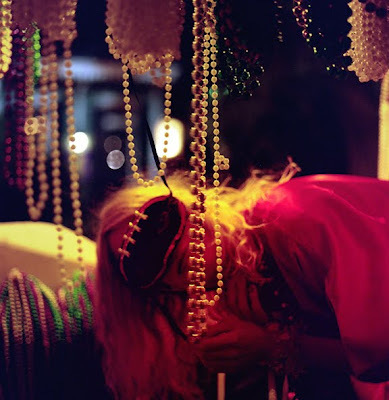 Photographs by Tabitha Soren during the Krewe of Muses parade, 2003. For a related post see “Nature Girl: The Art of Modeling.” Also look for this week’s Gambit post focusing on Soren's photography, publishing January 12th at Blog of New Orleans. lovely descriptions, followed by beautiful images of you Wendy Girl. I like to visit and meeting the BlueDog blog! You may remember me. My wife and two daughters and son went to George's book signing and your reading at Hicklebee's book store in San Jose. (My daughter Kylee presented George with her rendition of our dog). I had my first New Orleans experiences in the last few moths and have fallen in love with the city. Unfortunately I could only get down to the Quarter after the gallery had closed each day. I hope to get the family back there for the Jazz Festival. 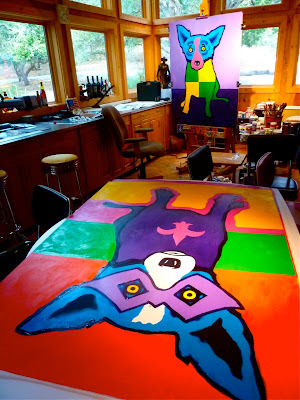 We are interested in acquiring the Mardi Gras Blue Dog that George painted in Carmel in the pictures dated January 8th 2011. Could you please drop me a note so that we can discuss? Thanks very much. ( I really do enjoy your blog). Hi Kurt --- I do remember you! George and I had a wonderful experience at Hicklebee's, that rare and special breed, a thriving independent children's bookstore. Unfortunately I do not have your email address, or I would pass it along to Amanda Foret at our gallery in New Orleans. She is there today and tomorrow, and could definitely give you more information regarding these beautiful works. You can reach Amanda at amanda@georgerodrigue.com or (504)581-4244. Finally, many thanks for your kind words regarding my blog. I'm always happy to know I have readers! And OiseauBird --- Merci Beaucoup to you, a French Floridian! And Dana --- We'd love to see you anytime -- Mardi Gras or otherwise! The computer age is so marvelous! 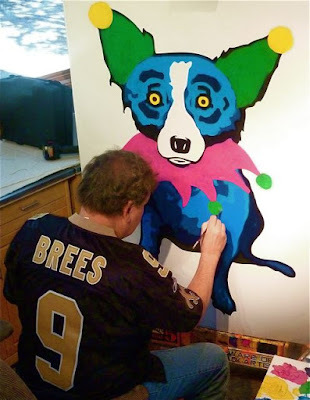 Seeing an image of George at his easel, wearing a Brees shirt, and painting...just as recently as 2 days ago! Looking forward to some pictures of dat tree! Keep up the excellent writing, Wendy. I love the paintings colors and it's very creative. Thanks for sharing these wonderful pictures. I have my Mardi Gras tree up! You need to take a picture of the tree and share it! I absolutely will --- Not to worry! Thanks for reading!